Two South African young men view a poster advertising a 2006 Chinese cultural festival in Pretoria, South Africa. While there is a long history of limited migration from China to Africa, the past decade has brought tens of thousands of Chinese to African cities, towns, and rural areas. These migrants are part of the growing political, economic, and sociocultural ties between China — now the world's second largest economy — and the poorest and most underdeveloped continent. In a clever political move, China recently supported South Africa's candidacy to become the newest member of the international organization of rapidly emerging markets that make up BRICS (Brazil, Russia, India, China, and South Africa), thus ensuring South African (and perhaps even African) support for China at the United Nations Security Council as well as other international bodies. In terms of economic ties, trade figures between Africa and China are dazzling with respect to both their rapid rate of growth as well as their actual total, now estimated at more than $120 billion. Beijing is now Africa's largest trade partner, with Chinese investments fueling 49 countries and a wide range of sectors, including mining, finance, manufacturing, construction, and agriculture. Where many Western investors see risk, the Chinese see opportunity — an outlook that has led to phenomenal growth in the numbers of Chinese in Africa. In 2009, the Chinese population in Africa was estimated at between 580,000 to 820,000. Today, that number is likely closer to (or even over) 1 million, although exact counts are virtually impossible to ascertain due to the mobility of Chinese migrants as well as highly porous borders within Africa, high levels of corruption within some African government agencies, and inefficiencies within agencies tasked with immigration and border control. While most Chinese in Africa are there only temporarily — as contract laborers and professionals — there are a growing number of Chinese migrants choosing to remain in Africa to explore greater economic opportunities. Recent research in southern Africa indicates that, although many Chinese migrants plan to eventually return to China, many in South Africa and Lesotho have already stayed years beyond their original plans. This article explores the various communities of Chinese currently residing in South Africa, their experiences in a highly stratified society, and their levels of political, social, and economic integration. In some ways, the experience of the Chinese in South Africa is unique to the country's particular social and historical context, but perhaps the South African case can prove instructive in terms of understanding what could be in store for new Chinese migrants in other countries in Africa. South Africa, as one of the most developed countries in Africa, is a popular destination for Chinese moving to the continent. According to some reports, well over half of all Chinese migrants heading to Africa end up at the southern tip of the continent. South Africa is also the only country in Africa with a significant population of Chinese South Africans (second-, third- and even fourth-generation South Africans of Chinese descent) and Taiwanese South Africans. The first Chinese to head to South Africa included a small number (no more than 100 at a time) of convicts and company slaves of the Dutch East India Company who settled the cape in the mid- to late-17th century. These Chinese were eventually repatriated or gradually became part of South Africa's growing mixed-race population, later called “colored” during the segregation and apartheid periods of South Africa's history. Given their small numbers, they did not maintain a separate Chinese identity on the continent. Chinese South Africans are commonly thought to be descended from Chinese mine workers, but this is not the case. 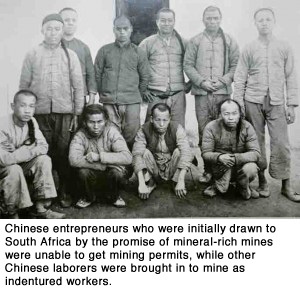 While over 64,000 Chinese were imported to colonial South Africa between 1904 and 1910 as indentured laborers to work in the gold mines, virtually all were returned to China. Thus, the ancestors of the Chinese South African community — about 10,000 strong today — are not descended from convicts, slaves, or indentured workers. Rather, they are distant relatives of independent migrants who began arriving in small numbers from Guangdong Province (then called Canton) as early as the 1870s and continuing through the mid-20th century. Originally attracted by the discovery of diamonds and gold, these intrepid explorers, most of whom were young men, thought they would make their fortunes in Africa and return to China wealthy. Instead, they were greeted in South Africa by discrimination and racist legislation that prohibited them from attaining individual mining licenses. This is rather ironic, given that other Chinese were brought in, under strict guidelines, as indentured mineworkers specifically to work the gold mines during the first decade of the 20th century. While independent Chinese continued to trickle in (and out) of South Africa for many decades, their numbers and their activities remained restricted. Gradually, a small number of Chinese women also entered South Africa as the brides of young male migrants. According to census data, in 1936 there were over 1,000 Chinese women in South Africa and 1,000 children born in South Africa of Chinese parents. Over the next decade, these numbers doubled. However, large-scale immigration from China was prohibited by restrictions in the Transvaal Immigration Restriction Act of 1902 and the Cape Chinese Exclusion Act of 1904. Other laws denied citizenship, prohibited land ownership, and restricted trade for the Chinese. Incidentally, these laws were not unlike legislation in place in the United States and other Western nations at that time. While the period after World War II brought some relief from racist legislation and practices for Chinese immigrants in the United States, Canada, and Australia, the Chinese in South Africa were faced with a dual-pincer effect: in 1948 the South African National Party won the national elections and soon thereafter began to implement apartheid legislation, and in 1949 the Chinese Nationalists were defeated by the Chinese Communists and forced to flee Mainland China. While there were a small number of Chinese permitted into South Africa between 1949 and 1953, the doors between the two countries were firmly closed by the Immigrants Regulation Amendment Act of 1953 in South Africa and the increasingly harsh legislation in China prohibiting emigration. Those trapped in South Africa faced racist apartheid laws. The migration stream between China and South Africa was shut until the late 1970s, when increasingly close ties between the apartheid government and the Republic of China (Taiwan) led to the first new immigration of ethnic Chinese in almost three decades. A small but steady influx of Taiwanese flowed into South Africa, lured by generous South African government incentives for Taiwanese investors and their families, including relocation costs, subsidized wages for seven years, subsidized commercial rent for ten years, housing loans, cheap transport of goods to urban areas, and favorable exchange rates. Almost all of the Taiwanese investors settled in rural parts of South Africa adjacent to former homeland areas, providing thousands of jobs in their textile and garment factories. Their arrival also served to slow black urbanization, one of the key goals of the South African government at that time. Increasing numbers of Taiwanese industrialists, and later small business owners and students that settled in the larger cities and towns, arrived in South Africa throughout the 1980s and 1990s. At the height of this migration there were close to 30,000 Taiwanese in South Africa. In the late 1990s and into the 2000s, a large number of these immigrants, many of whom had acquired South African citizenship, left Africa. Their departure was hastened by South Africa's official recognition of the People's Republic of China, ongoing difficulties with South Africa's labor regulations, stiff competition from the entry of cheap imported goods from China, and increasing crime. Today, most reports indicate that there are but 6,000 Taiwanese in the country. Virtually all who remain are South African citizens and can comfortably be referred to as Taiwanese South Africans. The last distinct group of Chinese in South Africa is from Mainland China. The earliest entrants came in with the Taiwanese as managers for the textile and garment factories in South Africa and neighboring Lesotho, valued for the lesser wages they demanded compared with Taiwanese managers. Others arrived as representatives of early Chinese trade and cultural forays on the continent, or as staff of private Chinese enterprises. Though the first group of Mainland Chinese migrants were often individuals with professional qualifications, business or political connections, overseas experience, and perhaps even some capital, later waves have been much more numerous and generally less educated and professionally qualified. The vast majority of Mainland Chinese migrants arrived in South Africa in the last decade, and many are from Fujian province as well as other regions of China not typically described as sending regions. The scale of the most recent waves of Chinese immigration is particularly difficult to ascertain, as increasing numbers of Chinese enter the country or remain in the country with false documents. Most publications indicate that there are now well over 350,000 Chinese in South Africa, while research conducted in 2010 indicates that there may be over 500,000. Irregular immigration, poor record keeping, and corruption within some South African government agencies contributes to lack of available data. How Integrated Are the Chinese in South Africa? Levels of integration of the Chinese in South Africa are difficult to ascertain because citizenship, language, and home and business ownership varies greatly depending on the subgroup of Chinese. While there are three distinct groups of Chinese in South Africa — the Chinese South Africans (or “local” Chinese), the Taiwanese, and new Mainland Chinese migrants — in terms of integration, it is more useful to consider two groups roughly divided by time of entry, either pre- or post-2000. Those who were born in or migrated to South Africa prior to 2000 tend to be fairly well integrated, while most of those who arrived after the year 2000 are less so. Most members of the first group are South African citizens or permanent residents and can be classified as settlers. Most speak English fluently, some speak Afrikaans, and others speak one or more of the local African languages. Some were born in South Africa, some grew up there, and all have lived in South Africa for at least a dozen years or longer. They own businesses and homes and have raised their children in South Africa. While most of them are married to other Chinese, some of their children (in small but increasing numbers) are marrying outside of the group. For most of them, South Africa is home, for better or for worse. Members of the second group were born in China and typically view themselves as sojourners — temporary migrants with intentions of returning to China. They get their news from Chinese newspapers and watch Chinese television on satellite or DVDs. They continue to socialize primarily with other Chinese, call China often, and, if they can afford to, visit China regularly. If they have children, these children are often sent back to China to be raised by relatives. The shares of Chinese that are “settlers” and “sojourners” are virtually impossible to ascertain, due not only to difficulties in data collection but also because these terms are highly subjective and fluid. Issues of citizenship, loyalties, and home are extremely personal and emotive. Additionally, there are sometimes differences within families in terms of levels of integration. One particular Taiwanese South African businessman in the Free State, for example, has earned the respect of the local community and a local name, Thabo, because of his fluency in Sotho and the relationships he has built with the locals. However, his wife is not convinced about their future in South Africa, and even after more than a decade in the country speaks little English or Sotho. In the meantime, both of their South Africa-born children are growing up as multilingual South Africans, speaking Chinese, Sotho, Afrikaans, and English. Length of time in the country is also not an exact indicator of greater integration. Older South Africans who were either born in South Africa or moved to the country as young men still feel like outsiders because of their experiences under apartheid. When interviewed about their sense of belonging, they said they wanted to retire and/or be buried in China once they die. On the other hand, a relatively recent Chinese migrant from Fujian Province claimed to be a dues-paying member of the African National Congress and has started his own local community-policing forum. While he is uncertain about whether or not he will remain in South Africa permanently, he is committed to being an engaged, active citizen in the broadest sense of the word. The political engagement of the Chinese as a whole might serve as a useful indicator of their level of integration into society. Since first arriving in the country, the Chinese have worked diligently but quietly, often behind the scenes, to become accepted as members of mainstream society in South Africa. However, there have also been a few examples of more active public engagement over the years. The first example of political protest occurred as early as 1906. Large numbers of independent Chinese participated in passive resistance campaigns alongside Indian resisters, led by none other than Mahatma Gandhi, who opposed the new Transvaal Asiatic Registration Act requiring all “Asiatics” to submit their thumbprints and personal details for official registration. Participation in these protests meant arrest, imprisonment, and deportation for some, as well as the creation of a long-lasting divide within the community. In fact, after this instance of passive resistance, the Chinese in South Africa did not actively participate in South African politics again until the 1960s. During the apartheid period, a series of draconian laws affected all nonwhite groups, including Chinese South Africans. Of all of the apartheid-era laws, the Group Areas Act of 1950 (revised in 1966) had the greatest impact on the Chinese because it threatened their livelihoods. Designed to force each separate race group to live and work within their own designated group area, the act was potentially disastrous for the small population of Chinese traders who had always made their living among other race groups. In essence, the act threatened Chinese economic viability in two ways: while the creation of a distinctly Chinese group area would strip the Chinese of their diverse customer base, to not be assigned an area would render the Chinese legally displaced with no official place to live or work. In the late 1960s, the Chinese around the country, under the loose coordination of the Central Chinese Association of South Africa, sent letters, memoranda, and other submissions advocating for the right to live among other races to anyone with influence. They also appeared before land tenure boards and, later, group areas boards. They argued that Chinese communities in South Africa were too small to warrant their own separate areas, and that they could not survive by trading amongst themselves. The Chinese negotiated for differential treatment also on the basis of their general acceptance within white society; their record as a quiet, law-abiding community; and their high standard of living. Eventually, because of the high cost of creating separate Chinese districts in each town or city for such a small group, particularly as the Chinese were scattered across the country, the Chinese in South Africa won their case. Permitted to live and work in select areas provided that surrounding white communities did not protest to their presence, the Chinese created what were arguably apartheid's first mixed-race areas. By 2004 — several decades after the apartheid-era victory — Chinese civic engagement reached a new level when it was announced that the newest members of parliament included four Taiwan-born South Africans. Interestingly, there was one Taiwanese South African for each of the major political parties represented: the African National Congress, the Democratic Alliance, the Inkatha Freedom Party, and the Independent Democrats. Such inclusivity in the political institutions of South Africa and the higher level engagement of Taiwanese in those institutions is regarded by some as evidence of both the increasing integration and acceptance of Taiwanese immigrants. Toward the end of the first decade of the new millennium, the Chinese South African community presented a legal and political challenge to the government while simultaneously making history and claiming its rightful place in South African society. On this most recent occasion, confusion and contestation arose around the exclusion of the Chinese from the specific language of two pieces of post-apartheid affirmative action legislation — the Employment Equity Act (No. 55 of 1998) (EEA) and the Broad-based Black Economic Empowerment Act (No. 53 of 2003) (BBBEE). After years of internal discussions and debates, meetings with government officials, presentations to parliament, and years of government indecision and inaction — all to seek clarification on their position vis-à-vis affirmative action legislation — the Chinese Association of South Africa (CASA) decided to press ahead with a court case. In December 2007, CASA launched a legal challenge against the South African government; specifically, the Minister of Labor, the Minister of Trade and Industry, and the Minister of Justice and Constitutional Development. "The [Chinese] community's struggle has not been about economic opportunism, but about [the] lack of recognition and clearing up of misconceptions of the historical injustices the South African Chinese faced." The court order only applied to Chinese South Africans and other Taiwanese or Chinese immigrants who had become citizens prior to 1994 — likely fewer than 20,000 in all. However, the lack of clarity about “which Chinese” and “how many Chinese” was a major contributing factor to the subsequent media frenzy and public reaction. Few South Africans distinguish between Chinese South African and Taiwanese South African citizens or new Chinese migrants. In fact, most Africans across the continent tend to refer to anyone from East Asia (and, at times, elsewhere in Asia) as Chinese. The strong negative public response dampened any sense of victory on the part of the Chinese South African community. It also provided further evidence of their marginal and tenuous position in South Africa, despite their efforts to integrate. In an effort to understand local perceptions of the Chinese in southern Africa, my research team administered approximately 300 questionnaires, 100 of which were implemented within the University of Johannesburg (UJ) community and the other 200 across Johannesburg and Soweto. A preliminary review of the survey data indicates that South Africans generally have a well-rounded view of the Chinese. For example, close to half of the UJ respondents agreed that Chinese small business helps South Africa generally, but with some costs. For example, some stated that the Chinese help to create jobs, but often employees must endure long hours and low pay. Others explained that the Chinese assist in bringing in consumer goods but “kill” some local businesses. The vast majority of the UJ survey respondents indicated that they saw the Chinese as hardworking (64 percent), disciplined (49 percent), and friendly (57 percent). A smaller number stated that the Chinese were business-minded (10 percent) and smart, wise, or intelligent (8 percent). An even smaller proportion of the respondents described the Chinese as unfriendly (4 percent); shady, “crooks & capitalists,” or “snakes” (3 percent); and arrogant (1 percent). Qualitative interviews with South African leaders and decisionmakers also revealed that most middle aged and older black South Africans in many parts of the country recalled generally pleasant encounters with Chinese South African shopkeepers from their youth. Often the Chinese were described as kind people who engaged with the local community, learned at least a few words of the local language, and would provide credit for groceries and sundries. Many younger white South Africans recalled the handful of Chinese South Africans with whom they went to school; these, too, were generally neutral or good memories. Given the generally neutral to positive relations with Chinese South Africans, it would appear that unless one had a bad personal experience with a Chinese person, the average South African was willing to give the benefit of the doubt. However, few were ever able to distinguish between a person from China, Taiwan, Japan, or Korea. This is not to say that the Chinese are welcomed with open arms into general South African society, if such can even be said to exist. Even 17 years after the end of apartheid, South Africa continues to be extremely divided along lines of race, ethnicity, and class. The negative reaction to the initial announcement of CASA's victory in their affirmative action case against the South African government is one indication that most South Africans remain highly confused and conflicted about how the Chinese fit into South African society. While outbursts of xenophobic violence in South Africa tend to target migrants from other African countries, our research indicates that Chinese and South Asian migrants seem to be inordinately targeted by criminals and corrupt officials. While robberies, car hijackings, and extortion may result from their overrepresentation in the retail trade, the practice of racial profiling is also a possible contributing factor. Our research has also found tensions between groups of Chinese, although these have shifted over time. Tensions between various groups of Chinese have existed for as long as the Chinese have been in South Africa. Among the early ancestors of today's Chinese South Africans, there were two distinct ethnic/language groups: the Cantonese and the Hakka (or Moiyeanese), both from Guangdong Province. These two groups settled in different parts of South Africa and did not mingle until well into the apartheid period when their small numbers and apartheid laws essentially forced them to coexist. The influx of a small number of unsavory immigrants who arrived with Taiwanese investors in the later part of the 20th century created further tension. In the late 1990s and early 2000s, South African newspapers were full of articles about Chinese involvement in illegal gill-net fishing; abalone, elephant tusk, and rhino horn smuggling; drug trafficking; and labor abuses. Because few South Africans drew any distinctions between the “foreign” or migrant Chinese perpetrators and the Chinese South Africans who prided themselves as quiet, law abiding, civilized, respectable South African citizens grew increasingly frustrated. Interviews conducted at the time revealed a great deal of anger on the part of the Chinese South Africans. Some voiced their frustration that South African citizens were being lumped together with the bad migrant element, while others went so far as to say that they did not identify at all with the Taiwanese and that they had given the Chinese a bad name. While there are still differences and minimal interaction between the Chinese South Africans and the Taiwanese, the rift seems to have lessened over time. Most recently, antagonism seems to have shifted from the Taiwanese to the Fujianese, who are now the main target of hostility. The Chinese South Africans, the Taiwanese, and the more settled Chinese Mainlanders — in other words, the settler Chinese — are highly critical of the newest, sojourner migrants from Fujian Province, seeing them as lower in class, thug-like, uneducated, and at fault for the negative Chinese stereotypes (gang members, smugglers, robbers, etc.) that have reemerged in South Africa. While South Africans might see one large, indistinguishable, and rapidly increasing body of Chinese in the country, it is clear that beneath the surface there are numerous threads and rifts that connect and divide the various communities of Chinese in South Africa. And occasionally, difficulties arise because most South Africans cannot and do not distinguish between those who are long-time residents and citizens of South Africa, and those who are temporary sojourners. South Africa is home to various communities of Chinese people who arrived at different times and from different parts of China and Taiwan. But the differences among them do not stop there: they speak different languages, practice different religions, and have vastly different levels of integration into local and national society. There are tremendous gaps among Chinese immigrants in South Africa in the areas of education, income, and experience. Some are citizens and permanent residents, determined to settle and make contributions to South African society. Others remain sojourners, planning to eventually return to China. The South African experience for the Chinese is arguably unique given the history of apartheid. However, this case can still be useful in understanding how new Chinese migrants might adapt in other African countries. National laws certainly have a huge impact on whether or not migrants will have access to certain rights or privileges, including citizenship; land, business and property ownership; trade; and education. Levels and types of political engagement are also, to some extent, determined by the state. However, as indicated by the ambiguous results of Chinese South Africa affirmative action court case, social perceptions may ultimately determine the levels of acceptance of any ethnic minority or new migrant group. In the South African case, despite the protections afforded by citizenship, the constitution, and other laws, all Chinese continue to occupy a somewhat ambiguous, marginal, and in-between position in South African society. Erasmus, Yvonne and Yoon Jung Park. (2008). Racial classification, redress, and citizenship: the case of the Chinese South Africans. Transformation: Critical Perspectives on Southern Africa 68: 99-109. Harris, Karen L. (1998). The Chinese ‘South Africans': An Interstitial Community. In The Chinese Diaspora. Selected Essays, Volume II, eds. Ling-chi Wang and Gungwu Wang. Singapore: Times Academic Press. Harris, Karen L. Chinese Merchants on the Rand, c. 1850-1910. (1995). South African Historical Journal 33: 155-168. Harris, Karen L. (1996). Gandhi, the Chinese and Passive Resistance. In Gandhi and South Africa: Principles and Politics, eds. by J. Brown and M. Prozesky. Pietermaritzburg: University of Natal Press. Harris, Karen L. (2006). Not a Chinaman's Chance: Chinese Labour in South Africa and the United States of America. Historia 51(2): 170-189. Hart, Gillian. (2002). Disabling Globalization. Places of Power in Post-Apartheid South Africa. Pietermaritzburg, South Africa: University of Natal Press. Park, Yoon Jung. (2010). Boundaries, Borders and Borderland Constructions: Chinese in Contemporary South Africa and the Region. African Studies 69(3): 457-479. Park, Yoon Jung. (2010). Chinese Enclave Communities and Their Impact on South African Society. In Strengthening the Civil Society Perspective: China's African Impact, ed. Stephen Marks. Park, Yoon Jung and Anna Ying Chen. (2010). Intersections of Race, Class, and Power: Chinese in Post-Apartheid Free State. In Society in Focus: Change, Challenge and Resistance. Reflections from South Africa and Beyond, ed. by Lindy Heinecken and Heidi Prozesky. Newcastle upon Tyne: Cambridge Scholars Publishing. Park, Yoon Jung. (2009). Chinese Migration in Africa Occasional Paper No. 24. China in Africa Programme, South African Institute for International Affairs. Johannesburg: SAIIA. Park, Yoon Jung. (2008). White, Honorary White, or Non-White? Apartheid-Era Constructions of Chinese. Afro-Hispanic Review, Special Issue on Afro-Asia 27(1):123-138, guest eds. Evelyn Hu-DeHart and Kathleen López. Park, Yoon Jung. (2008). A Matter of Honour. Being Chinese in South Africa. Johannesburg: Jacana Media Pty (Ltd). Park, Yoon Jung. (2006). Sojourners to Settlers: Early Constructions of Chinese Identity in South Africa. African Studies 65 (2): 201-23. Oxfordshire: Taylor and Francis Group, Ltd. on behalf of the University of the Witwatersrand. Yap, Melanie and Diane Leong Man. (1996). Colour, Confusion and Concessions. The History of the Chinese in South Africa. Hong Kong: Hong Kong University Press. Dr. Yoon Jung Park is currently a freelance researcher. She is a non-resident Senior Research Associate of the Sociology Department at Rhodes University and serves as the convener/coordinator of the Chinese in Africa/Africans in China (CA/AC) International Research Working Group.